Nicole Richie has just blogged about her love of her favourite blow dry the Brazillian blowdry. "Last night I got another Brazilian blow dry. Some of you may remember I’ve written about this treatment before. It has saved me so much time and ultimately has made my hair grow since I’m not putting direct heat on it everyday. I even got my mom to get one last night and she hasn’t stopped talking about it since. I cannot recommend this treatment enough, it’s the best thing I’ve done in a while. For those of you who are interested in trying out this amazing treatment, call the Andy LeCompte Salon at (310) 273-4100 and ask for Liz." 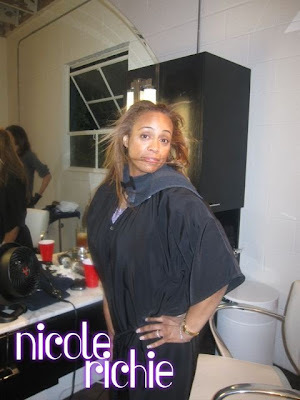 Nicole and Mom, Brenda Richie show off the results of their Brazillian blow dry. Nicole's friend Shane Powers asked a valid Twitter question about the Brazillian blow dry ..
"shaneheadboy@nicolerichie not tryin to be difficult.. what's the difference between a normal blow and a brazilian blow?" "nicolerichie@shaneheadboy 2 put it very simple (in guy terms) getting it once every 4 months, instead of once a week"
I love the look this achieves of Nicole's hair, it looks poker straight yet still has volume. I don't think I understand - is it like a hair straightening?